We were in the mood for Spanish food again last night, and happened to have the typical Spanish ingredients on hand (onions, garlic, olives, red bell pepper, sherry, tomatoes, oh and did I mention sherry?) 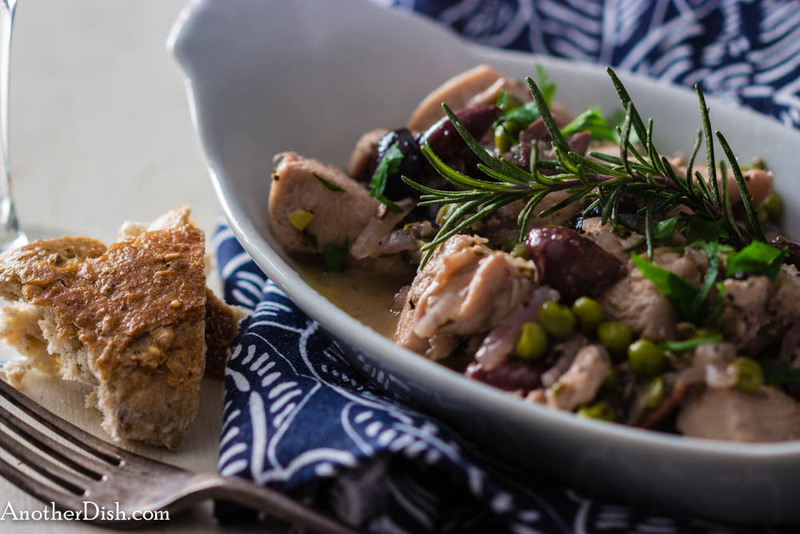 to make this quick, delicious, after-work chicken dish. To me, the hint of sherry in Spanish dishes is what gives them their uniquely Iberian, wonderful depth of flavor. A note on pine nuts — make sure you use only European pine nuts. I learned the hard way that Chinese pine nuts cause “pine mouth,” which is a bitter aftertaste that throws off the taste buds for days. I even read that the pine nuts that grow in Asia are not even edible! Anyway, I hope you’ll try this dish after a hard day’s work some night! Sprinkle 1 tsp salt and 1/4 tsp ground black pepper over chicken. Heat 1 Tbsp olive oil in a large pan over medium-high heat. Add chicken and brown, about 5 minutes. Remove chicken with slotted spoon and set aside. Add another 1 Tbsp olive oil to pan. Stir in onions, garlic and bell pepper. Cook until softened, about 5 minutes. Stir in sherry and cook another minute. 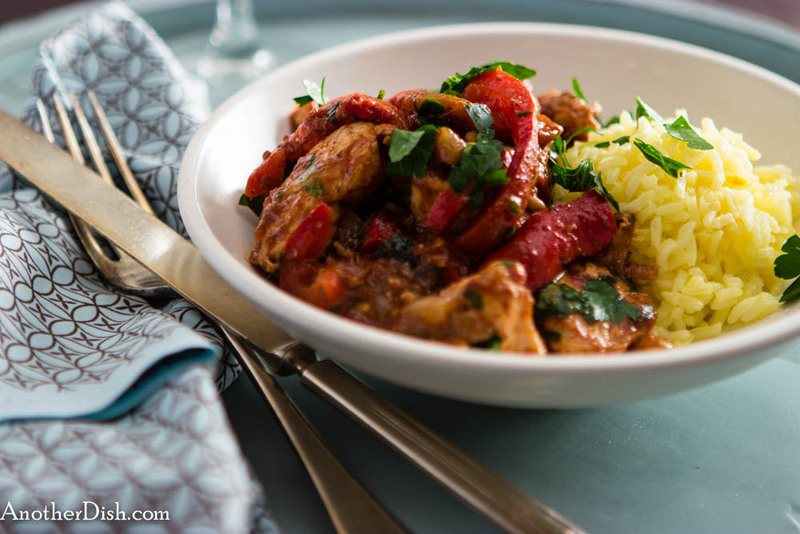 Stir in wine, chopped tomatoes, tomato paste, remaining 1/2 tsp salt, olives, pine nuts, raisins and the chicken. Turn heat to high and bring to a boil. Reduce heat to low, cover and simmer 15 minutes. Remove from heat and serve with saffron rice. This entry was posted in Chicken, Main Dishes, Olives, Spanish and tagged Cooking, Food, Food Photography, Foodie, Recipes, Spanish Food on March 14, 2015 by AnotherDish. 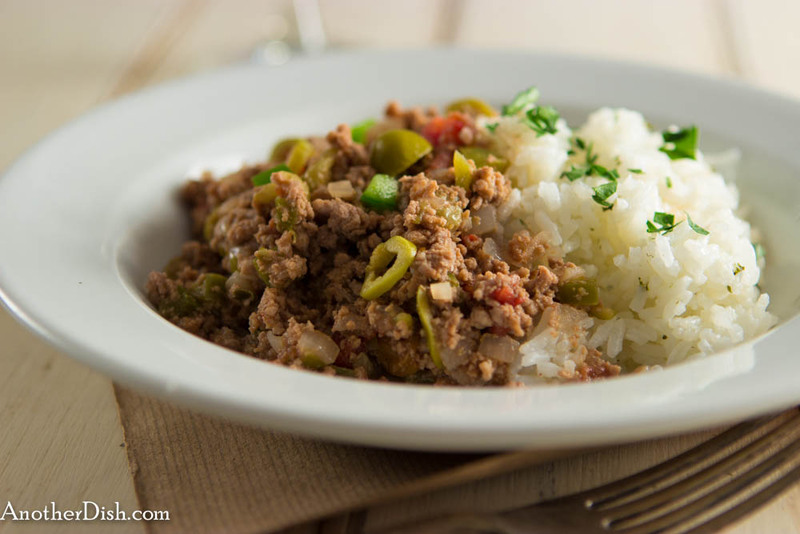 Picadillo is a flavorful, traditional dish served in Latin America. Its ingredients vary a bit from country to country, but most versions typically feature ground meat, chopped green bell peppers and onions. Mine is more of a Cuban variety, with ground beef, ground pork, peppers, onions, garlic, raisins, olives, capers and other ingredients, which provide for delicious sweet and sour flavors (“picadillo,” by the way, is derived from the Spanish picar, which means “to chop”). I hope you’ll give it a try! Heat olive oil in a Dutch oven over medium-high heat. Add the onions, garlic and green bell peppers, and saute for 4 minutes. Add the tomatoes, salt, black pepper, beef and pork. Cook the mixture for 5 minutes (or until meat is no longer pink), stirring constantly to break meat up. Add the rest of the ingredients (through red wine). Turn heat to high, stir and bring mixture to a boil. Reduce heat to low, and simmer, uncovered, for 1 hour (stirring occasionally). Season to taste with salt and pepper (I added an additional 4 tsp salt, which seemed about right). Meanwhile, prepare the rice. For the herbed-rice, follow my recipe for steamed jasmine rice, but add 1 Tbsp chopped fresh parsley at the beginning. Serve warm picadillo with the rice. This entry was posted in Beef, Cuban, Main Dishes, Olives, Pork and tagged Capers, Comfort Food, Cooking, Cuban Food, Food, Food Photography, Foodie, Jasmine Rice, Recipes on June 2, 2013 by AnotherDish.